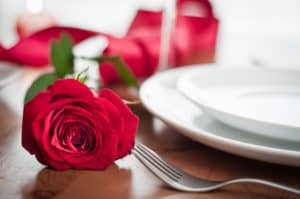 Valentine’s Day is right around the corner, and if you’re planning to take your date out for a romantic dinner, here’s a list of 10 romantic restaurants in Atlanta that are sure to spark that romantic flame! Situated on the banks of the Chattahoochee River with a gorgeous outdoor garden, Canoe is my all-time personal favorite. Offering upscale southern cuisine, Canoe is elegant, but cozy. Be sure to ask for a table overlooking the river, and when you’re done with dinner, take a stroll outside on the garden path… a perfect place to seal the deal for a romantic Valentine’s Day kiss. With breathtaking 360 degree views of the city from a rotating platform, it’s no surprise that there is an engagement almost every day at Sundial. With live jazz, great ambiance, and that special someone, Sundial is the perfect recipe for romance. Park 75 has a luxurious atmosphere, superb food selections, and flawless service. If you want to impress a date on Valentine’s Day, you can’t go wrong with Park 75. Not only will you both feel pampered like rockstars, your date is sure to appreciate you on this special day. Owned by the same group as Canoe, Aria is a great choice if you’re looking for romance. With candle-lit white linen tables, an eclectic atmosphere, and six-course tasting menu, Aria is sure to be a unique dining experience to impress your special valentine. The first rooftop restaurant in the city, Polaris’ blue dome boasts gorgeous views of the city from its rotating restaurant and lounge – perfect for a romantic date night. They actually closed for a long time, and then reopened in 2014, boasting a sleeker and more sophisticated dining experience. If Sundial is too busy, or you want something different, your Valentine’s date will appreciate the spectacular views here, including you! Known as one of Atlanta’s favorite five-star restaurants, Bacchanalia is a favorite for special occasions and romantic meals. Bacchanalia offers a four course, prix fixe menu at $85 per person. The menu evolves slightly each evening and they offer a wine pairing suggestion with many of the menu options. With its cozy and intimate setting and amazing 5-star reviews, you’re sure to wow your Valentine! If you’re looking for a more relaxed date night warm lights and an old-world feel, Agave is a superb choice. Ask to be seated in the side room, where you can enjoy a fireside dinner, or in the loft, where there’s only a few tables to provide more intimate conversation. Their award-winning margaritas and unique southwestern cuisine is the perfect Valentine’s day destination without all the fuss. Dine with a spectacular view of the Atlanta skyline, Piedmont Park and the Beltline with your valentine at this renovated urban warehouse. Simple but elegant, this place offers a 75-bottle wine list and a menu focusing on fresh, seasonal ingredients. You can’t go wrong if you end up here with your sweetheart. If your date has a flair for Paris, then the glamorous interior and classic French cuisine at Bistro Niko is hard to beat for the perfect date night. They’re located right on Peachtree so if you sit outside on the patio, you’ll have a great view of Buckhead. From mouthwatering croissants to homemade ice cream, you’re sure to sweeten your valentine’s mood at Bistro Niko! Voted as one of the top steakhouses in the country by Details Magazine, among several other awards and accolades, you can’t go wrong at Kevin Rathbun Steak. They offer a tantalizing menu of steaks, seafood, alternative meats and a generous selection of appetizers and sides. Originally an old cotton warehouse, Kevin Rathbun Steak has a cozy atmosphere with dimmed lights and dark accents – perfect for an intimate dinner with your special someone. After an amazing dinner, there’s no better place to finish off your perfect Valentine’s Day with an after dinner drink, coffee, or dessert at Cafe Intermezzo. Enjoy soft music, a walkaround dessert display, and a drink menu offering almost anything your taste buds can dare to imagine. I picked the Perimeter location because I love the heated outdoor seating in the courtyard, but if you’re closer to one of their other locations, it is sure to be a great place to steal your sweetie’s heart before the night ends! And when you get engaged and you’re ready to find the perfect home for wedded bliss, The Peters Company will be sure to help you find the one that steals both your hearts!